Items that are in stock will usually be processed and dispatched within 1-5 Working Days. During busy periods this may be extended up to 10 working days. Any back-orders/pre-orders will be dispatched within 1 day of stock arrival. Our despatch times apply to all our shipping options excluding DPD Next Day options. The service we use for your chosen delivery option will depend on the weight and value of your order. When orders are sent out by courier, you will usually receive a tracking number via email. We obtain Proof of Posting on all our dispatches. If you have a free delivery promotional code, enter this into the coupon box on the checkout page. *Only valid for UK delivery. **Excludes Weekends and Bank Holidays. We are happy to ship worldwide! Select the International Shipping option that you want from the checkout page. The relevant shipping options available to you will automatically show on checkout. Please note we are not responsible for any related costs such as customs and tax etc, this will be your responsibility and you will be liable to pay such charges. Standard Flat Rate Shipping will not have a tracking number for customers to use, however, if there are any problems we do receive a tracking number for RM to use on their systems only and we always obtain proof of postage. Tracked Flat Rate Shipping is a fully tracked service. Please note large items or heavy orders may incur extra postage costs. In these cases, you will be notified and quoted the additional costs via email. If you would then like to change your mind you can, of course, cancel part of/the full order. Once we get the go-ahead from you, we will invoice you the additional charge. Once this has been paid, your order will be processed. Delivery times will vary and depend on your destination. For the most parts of Europe, the estimated timescale is between 3 to 25 working days. For the most part of the USA, the estimated timescale is between 5 to 25 working days. During busy periods, delivery may be longer. If you wish for us to find your destinations delivery time, please don’t hesitate to contact us. Unfortunately, we do not offer free shipping on international orders. Please be aware electrical products may not work properly or have the correct plug for your country. Please check with the manufacturer. If you change your mind and want to return any part of your order, you can do so within 14 working days from dispatch. We will give you a full refund of the purchase price on returns received within these 14 days. Any products returned must be unused, unopened and in its original packaging. When returning products, include your order number, name and product returned. You are responsible for the return postage cost unless you are returning due to our error, in which case we will provide a prepaid postage label. We strongly recommend you obtain proof of postage on all returns. We can not be held responsible for returns that are lost or damaged in transit. Shipping costs will not be refunded. If you had free shipping on your order and the return products fall below the threshold of free shipping, the standard flat rate shipping cost will be deducted from any refund. As soon as we have received your returned products, we will process a refund or replacement within 1 working day of availability. For all the terms and conditions please see our terms and conditions page. If there are any problems regarding your order, please contact us asap so we can rectify the problem. Include your order number and name in your messages. We will aim to reply within 1-2 working days. You can contact us by emailing contact@devotedcrafts.co.uk. You can cancel or amend your order at any time during its processing stage up until dispatch. To do so, just get in touch. If you wish to cancel or amend an order, you can let us know immediately via your account. Log in and find the order you wish to cancel or amend and click the cancel button. This will stop the order being dispatched in the meantime until we respond. Don’t worry, this will not remove your order or refund it, it simply just lets us know not to dispatch it. Credit/Debit Card – We have 2 ways to pay via card. Either via Stripe or PayPal. 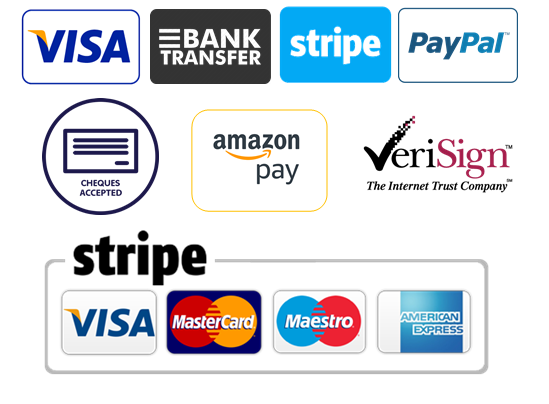 To use Stripe, simply click this option at checkout, enter your card details and hit the submit button. If you wish to pay via Credit or Debit Card you can do so via PayPal on the checkout page. You do not need to have a PayPal account. Just click on guest checkout on the PayPal checkout screen. PayPal – If you wish to pay via PayPal just follow the PayPal checkout instructions from the checkout page. Bank Transfer – You can now pay via bank transfer using online banking or visiting any Natwest branch. Simply select bank transfer as your payment option on the checkout page and follow the instructions. Use DC along your order number as your payment reference, for Example, DC1234. Drop us an email to let us know payment has been made. Orders will be processed once payment has been received. Stripe – Pay via card. Simply select this option at checkout and follow the instructions. Cheque/Postal Order – You can pay us via Cheques and Un-Ticked Postal Orders. Simply select this option at checkout and follow the instructions. Once Payment has been received and cleared, we will then process and despatch your order. Amazon Pay – You can pay via Amazon pay. Simply select this method at checkout and log in and pay with your Amazon Pay account. All orders are totalled and processed in the UK via GBP Sterling (£). The payment method provider you choose to use will convert this for you. In stock items means that we have stock ready and the usual normal dispatch and delivery time applies. All orders have a dispatch time of 1-5 working days. Please note when we experience busy periods, orders may take up to 10 working days for dispatch. Fast Shipping orders will be priorities. Out of stock products may be discontinued or we are not expecting further stock of the product. If you wish to inquire about any out of stock products, please contact us. You will not be able to add out of stock products to your basket. If there are any products you are looking for but can’t find on our website, drop us a message to find out if we can order it in for you. We are always adding new stock, new brands and new launches to our website, keep in the loop by following us on social media and signing up for our newsletters. Product back ordering means you can order and reserve stock we are currently awaiting or are able to order in. 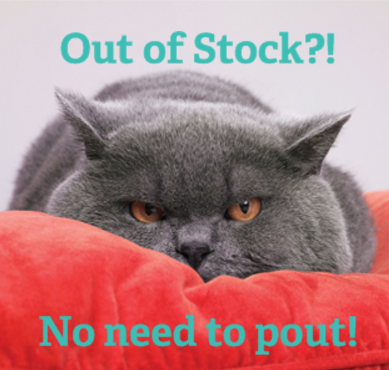 It means we don’t have the stock available for immediate dispatch but are awaiting a new batch. Products that are available to order on back order will state available on back order on the product page. If you buy any product that is on back order, this will show as on back order in your basket, at checkout and on your order confirmation. Products available on back-order can be added to orders and will be dispatched once our stock arrives. Back Order means we are awaiting our stock for this product. Any back ordered products included in your order will be dispatched once stock arrives. If you wish to know the expected arrival, please pop us a message for more information. All international orders will be held until the full order is in stock. UK orders will usually be despatched in separate orders, with the in-stock products being sent first and the pre-orders/Back-Orders to follow once stock arrives. In some cases, for example, if the due arrival of the Back Ordered/ Pre Ordered stock is less than 7 days away, we may wait for the full order before dispatching. Pre-Orders are available for brand new products. You can order a new product that is due to launch and reserve your stock for when it arrives. Once the product launches, yours will be processed and dispatched. Pre-Ordering ensures your stock from the initial launch 1st-time stock, meaning you will be one of our first customers to get your hands on these craft goodies! Pre-order estimated dispatch dates are stated in the product description. These dates may be subjected to change. Once dispatched you will be notified via email. All international orders will be held until the full order is in stock. UK orders will usually be despatched in separate orders, with the in-stock products being sent first and the pre-orders/Back-Orders to follow once stock arrives. In some cases, for example, if the due arrival of the Back Ordered/ Pre Ordered stock is less than 7 days away, we may wait for the full order before dispatching. You can subscribe to pre-order update emails on some pre-order products by following the link in on the pre-ordered product order notes or click here to be taken to the update subscribe page. We will then email you with any date changes or other updates as we are given them. Subscribe to our newsletters for all the latest products, news, special offers and the latest launches. We want to be able to provide all our customers with excellent service and great choice, so we offer our customers a service called Product Stock Request, and it’s exactly that! If we don’t currently stock the craft product you are looking for, contact us and we’ll aim to get stock in for you! In your message include the product name/description and a photo if possible. If we are able to get stock, we will, of course, offer you the best price possible. If we are unable to source the product, we’ll recommend similar or alternative products. We want to offer all our customers the best price around on all the wonderful products we offer and for you to know you are getting the best deal when you shop with us! This is why we offer our Price Promise. Its simple, if you find the same product cheaper on any of our competitor’s websites on the same day of your purchase we will refund the difference and give you a 5% Discount on your next order! How to I make a Price Promise Claim? If you have found the product you purchased cheaper on the same day as you made your purchase, you can then make a Price Promise Claim. Send the proof of your price match claims such as the URL or a screenshot showing the date, product, price, and website of the product you have found cheaper, to pricematch@devotedcrafts.co.uk within 7 days after your purchase date, along with your order number. Go to the product page and click Request Price Match. This can be found under the product image on the left-hand side of the product page. Then just follow the instructions and fill out the form. The email address must match the one you used when placing your order. We will then look at your claim which can take up to 5 working days. We will contact you via email. Once we have verified the price match we will refund you the difference and give you a 5% discount code to use off your next order! Price match on the same product on the same day of your purchase. Valid claim against any online craft retailer in the UK. Includes pre-orders and back orders. You must have placed an order to be eligable for price match. Price match is not eligible on purchases from any auction sites, including but not limited to ebay, Amazon, ebid etc or public selling sites such as but not limited to Gumtree, social media sites, Shpock, preloved etc. You must provide the URL or a screenshot from an eligible online retailer showing price, website, date, and product. Price Match does not include competitors price after new customer discounts and is only valid for the product price before any additional discount codes. Price Guarantee does not include P&P. The claim must be submitted within 7 days of purchase. For our T&C’s, please visit our Terms & Conditions Page.